to be copied to the clipboard (applies to Outlook, Outlook 365, Gmail). After you design your signature, you will get step-by-step guidelines on how to apply it in the chosen mail platform. The preview is displayed directly below (or at the bottom, if you view this page on a mobile device). The email signature generator comes with various types of signature templates, including both simple, minimalistic designs and templates with photos, banners, logos, and social media links. You can change your template anytime. 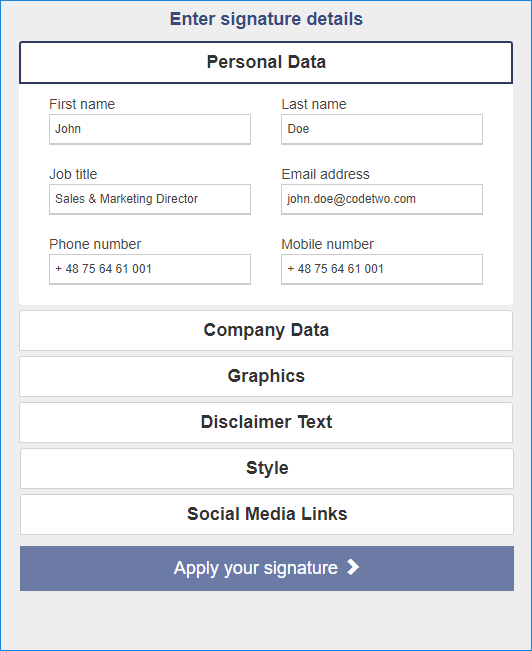 Depending on the selected signature template, different sections and fields are available. These fields include sample data, so you need to replace this data with your own. Our generator keeps the information you provide, so you can switch between different signature templates during the editing process (the signature details are removed when you close or refresh the page in your web browser). If you don’t want to include certain fields in your email signature, simply clear all data from these fields. Blank fields do not appear in the signature preview. For example, if you want to include only Facebook and Twitter links in your signature, delete the links to all other social media platforms. Some signature templates include graphical elements such as banners, photos or company logos. You can configure them in the Graphics section. The next step is to replace the default graphics with your own. Choose an image that suits the selected signature template, especially when it comes to size and shape. For example, if the selected template has a rectangular, horizontal logo, it will probably look bad if you use a vertical logo instead. For some graphics, the generator shows hints that help you optimize the format and appearance of your email signature. Upload the image to your server, a file hosting service (e.g. Google Drive), or an image hosting service. Copy the link to your image to the clipboard. Make sure you are using a direct link to the image, not a shareable link. See our guide on how to get a direct link in some popular image hosting services for details. 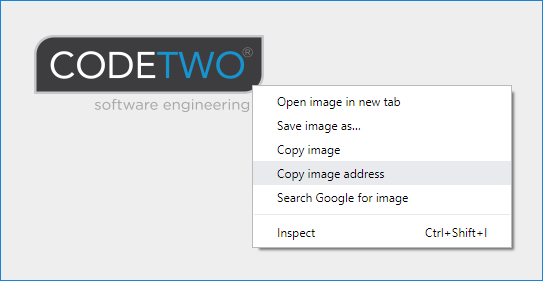 Usually, it is enough to open the shareable link, right-click the picture and choose the option to copy the image address (see below how to do it in Google Chrome). The image link needs to begin with http or https. Test the link by opening it in another web browser and checking if you can see the image. Paste the copied link into an appropriate field in the Graphics section. 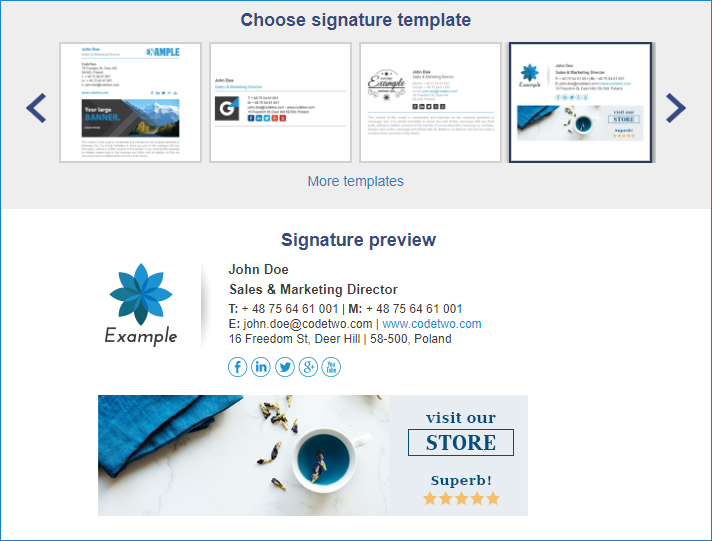 The Signature preview pane will show how the image looks in your signature template. The Style section allows you to change the color and type of fonts and vertical/horizontal lines in your signature. The font color fields correspond to certain blocks of text in the signature and/or vertical or horizontal lines (if they are included in the design). Because different templates have different layouts, the colors may apply to different elements in different signatures. To change a color, click it to open a color picker or type a Hex color code directly. All fonts available under Font style are email signature safe, which means they are displayed correctly on most email clients and devices. Click Apply your signature to see detailed instructions on how to use the prepared signature in the email platform you’ve selected. If you need instructions for other platforms, change the platform as described in Choose an email platform. What are the requirements to use the signature generator? Why can’t I see the image that I’m linking to? Instead of a link to the image you pasted the image itself, encoded in the base64 format. Confirm that your link starts with http or https, and NOT with data:. Make sure you are copying the link to the image and not the image itself! My recipients cannot see images in my email signature. What can I do? If you can see images in your email signature, but your recipients cannot, it is most probably caused by their email client. Most email clients block linked pictures. To make sure your email signatures are not blocked by email clients, you can use an email signature editor to embed those pictures. This option, however, is not possible for the native global email signature option in Exchange and Office 365. 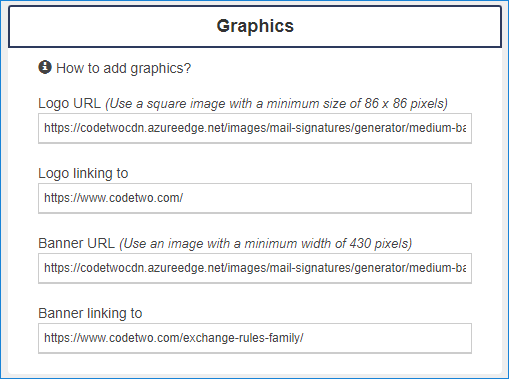 If you want your global Office 365 signatures to display images and be branded every time, take a look at CodeTwo Email Signatures for Office 365. For the same functionality in an Exchange server, check out CodeTwo Exchange Rules. Can I use images from my computer? You can’t upload images from your computer directly to the generator. You first need to upload them to an online service (e.g. Google Drive, or any other file hosting service), and then paste the link to your image into the appropriate field in the generator. Different signature templates use graphical elements of different sizes and arrangement. We recommend using images that resemble the sample images in templates. For example, if the original image is a horizontal rectangle, it would probably be best to use an image of the same shape. To provide some help, we have included basic hints regarding the graphical elements (e.g. minimum size of the image) next to input elements for those images, as described here . Can I change the color of some elements in my signature template? Yes, you can change the font color and style in the signature. To access the style options, go to the Style section of the email signature generator. Can I change the color of social media icons? No, the current version of the signature generator does not allow you to change the color of social media icons in a signature template. However, you can apply the signature to your email client and use its signature editor to replace the social media icons with the ones from another email signature template. Your browser adds unnecessary code to the signature while copying it to the clipboard. This often happens when you use the email signature generator in the Microsoft Edge browser. The problem can be solved by using Google Chrome or Mozilla Firefox to generate your email signature. How can I use the generated signature template in other email platforms or devices (Yahoo, mobile devices, etc.)? It’s not possible for us to include instructions for all email platforms, but we will continue to write articles on how to add signatures in various email platforms.